Upper Lake Powell, in the fall of 2014. GLENWOOD SPRINGS – Two Western Slope water conservation districts are moving forward with the third phase of a “risk study” exploring how much water might be available to bolster water levels in Lake Powell, and they are doing so without state funding to avoid Front Range opposition to the study. 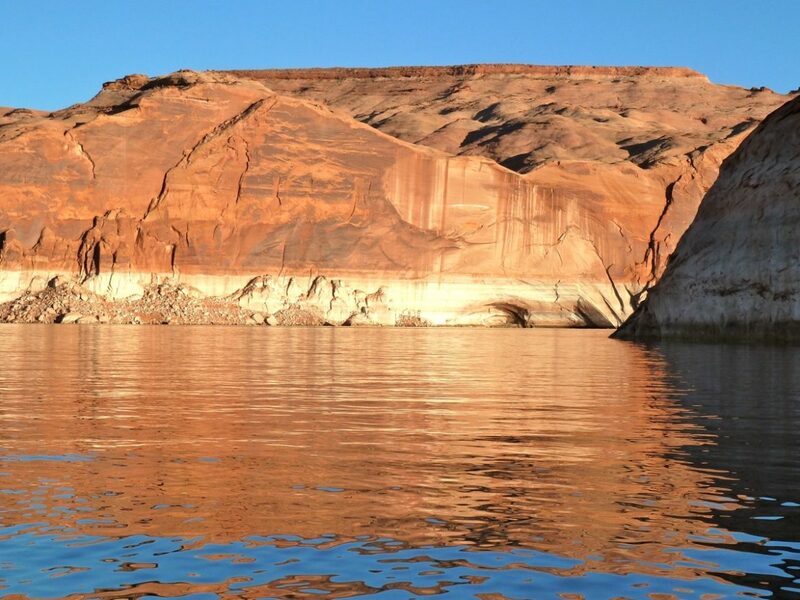 Lake Powell today is half-full and dropping and water managers say several more years like 2018 could drain the reservoir, which today contains 12.3 million acre-feet of water. And the looming water shortage is revealing lingering east-west tensions among Colorado’s water interests. Officials at the Colorado River Water Conservation District and the Southwestern Water Conservation District, whose boundaries include the Yampa, Colorado, Gunnison, and San Juan river basins on the Western Slope, are eager to answer some forward-looking questions, which were discussed at a meeting in April of the four Western Slope basin roundtables which work under the auspices of the Colorado Water Conservation Board. How much water in a hotter and drier world might still be available from Western Slope rivers to divert and put to beneficial use, for example. And how much water might be made available from current water users to send downriver from each of the major Western Slope river basins to help fill Lake Powell? But that second grant-review process brought opposition from the Front Range Water Council, which unsuccessfully sought to block the requested funding from the Western Slope. The Front Range Water Council is an ad-hoc group that includes Denver Water, Northern Water, Aurora Water, the Pueblo Board of Water Works, Colorado Springs Utilities, the Southeastern Colorado Water Conservancy District, and the Twin Lakes Reservoir and Canal Company. The first two phases of the Western Slope’s risk study showed that 1 million to 2 million acre-feet of water from current water users may be needed to bolster levels in Lake Powell, especially if more water is also diverted to the Front Range. As such, officials at the Western Slope conservation districts are now asking if, say, 10 percent of that water use was cut back over time, in a voluntary and compensated demand management program, and the saved water was banked somewhere — ideally Lake Powell itself — would that be enough to keep the big reservoir full enough to still produce power at Glen Canyon Dam and deliver enough water downstream to meet the terms of the Colorado River Compact? On Monday, the members of the Colorado roundtable unanimously passed a resolution to that effect. Mueller assured the roundtable members that the two districts will work to make the mechanics, and the results, of the evolving water-modeling tool available. Editor’s note: Heather Sackett of Aspen Journalism contributed to this story. Aspen Journalism is reporting on water and rivers in the Roaring Fork and Colorado river basins in collaboration with The Aspen Times and other news organizations. The Times published a version of this story on Friday, July 27, 2018. The Vail Daily published the story on July 28, 2018.